The primary objective of innovation coaching is to improve the competence and knowledge of clients, in particular within areas of creativity, idea finding and innovation culture or indeed to learn and develop particular creative skills. Benno van Aerssen has consequently developed his innovation coaching for teams and organizations from his creative trainings and from the classic team building training. 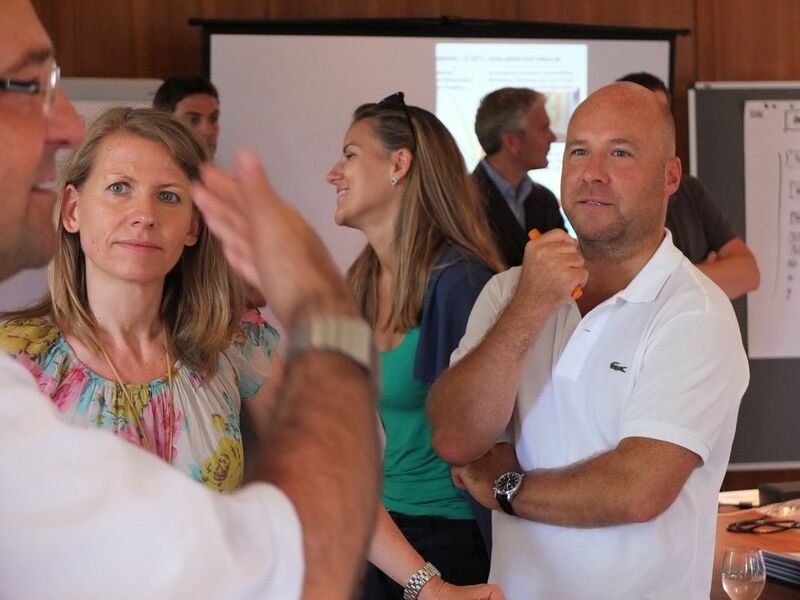 Benno van Aerssen's innovation coaching is either a team or individual coaching with the clear aim of helping others help themselves when it comes to creativity and in order to develop solutions for current business challenges in an innovative way. In this area of the website you will find information on innovation coaching, idea finding , creativity techniques as well as about Benno van Aerssen as trainer and coach for your team or your company. Innovation coaching can do much more! Benno van Aerssen describes it like this: " Innovation coaching is actually two coachings rolled into one". Not only is the creative prower of your team strengthened, but also team interaction, cooperation and mutual support, synergies within the team, visual imagination when tackling problems, following common objectives and much, much more. Creativity is actually one of the key skills necessary to initiate change. But we just don't learn creativity - enough of it is already there in each and every one of us. Benno van Aerssen knows the methods and creativity techniques which encourage and yield creativity in your team. Innovation coaching, according to Benno van Aerssen, takes place during a trusting, empathetic interaction between coach and team, on a level of mutual understanding. Innovation coaching is always done in partnership and at eye level. The aim of innovation coaching is always the implementation of challenges which have been analyzed and set by the company or department management. Benno van Aerssen's particular attention to the senses and to feelings are very special guarantees for success for your objectives. Thus every single member of the team does not only gain more know-how from a successful coaching but above all is then a multiplier within and outside of the company. The team becomes the active implementer and ambassador of your corporate goals, as well as company vision, mission and success. Benno van Aerssen's' systemic innovation coaching offers companies and organizations the opportunity to develop strategies for increasing innovation over several stages. Innovation coaching is aimed at companies and organizations who wish to free themselves from current ways of thinking and ways of doing things and who wish to re-align internal processes and structures in order to create a desirable future. Many companies today are hardly in a position to carry out change processes for the future from within. They even try to overcome current challenges by making as little change as necessary and by maintaining current processes as long as possible. These companies are in a state of "tension in the present". In this condition, dealing with changing market and customer requirements takes a huge effort.